This clever coloring book uses old-school tech to enable kids to hack basic illustration. Using pixels, the smallest element of a picture on a screen, this collection of interactive shots encourages crafty tots to ink in the box! After kids finish coloring the illustration with their choice of medium—crayons, colored pencils, paint, or markers—a prompt on the opposite page encourages them to create accompanying objects using the same square-by-square constraints. Draw some tasty s'mores for a camping grizzly bear, create a toothbrush for a donut-dining pigeon, or imagine yourself as the lead singer of a four-part rock band! With dozens of imaginative ideas and dazzling illustrations, this captivating coloring book turns every doodle into a cubist creation with a Silicone Valley attitude. Made in China. 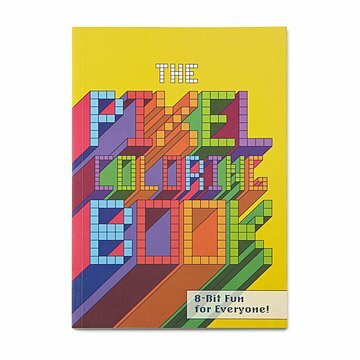 Please note: the Pixel Coloring Book has been discontinued. Once it sells out it will no longer be available. Older sister enjoyed getting a gift, too. I had to explain the way to use it. Then, she got right to it. Using pixels this collection of interactive shots encourages crafty tots to ink in the box!